Lot Detail - Frank Lentini. 3 Legged Man Sideshow Banner. Frank Lentini. 3 Legged Man Sideshow Banner. Wyatt, Snap. Frank Lentini. 3 Legged Man Sideshow Banner. Tampa: Snap Wyatt Studios, ca. 1950. 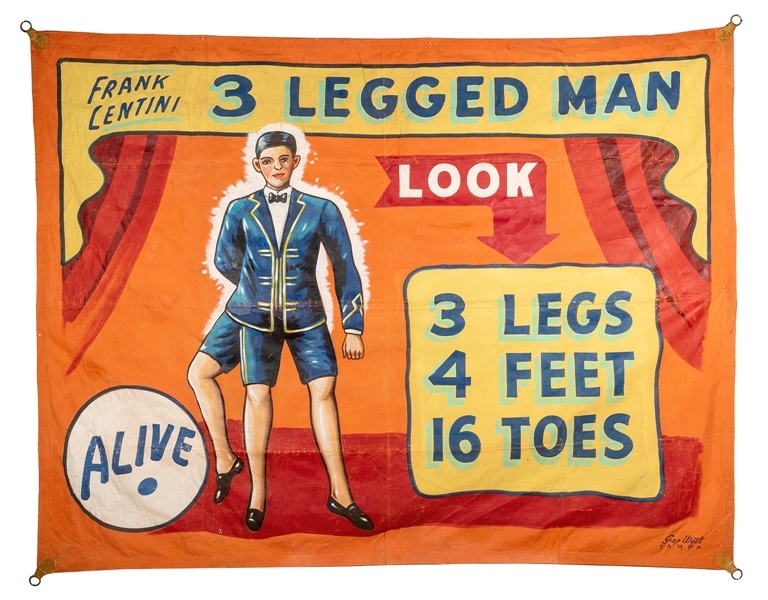 Vibrant orange and red canvas banner advertises the man with “3 Legs, 4 Feet, 16 Toes.” 97 x 115”. Worn but very good condition. Wyatt (1905 – 1984) created many iconic banner designs. He worked quickly, claiming he could paint at least one banner per day at a retail cost of $85 each. In his heyday, he reportedly produced as many as 400 banners per year. Auction closed on Saturday, November 10, 2018.